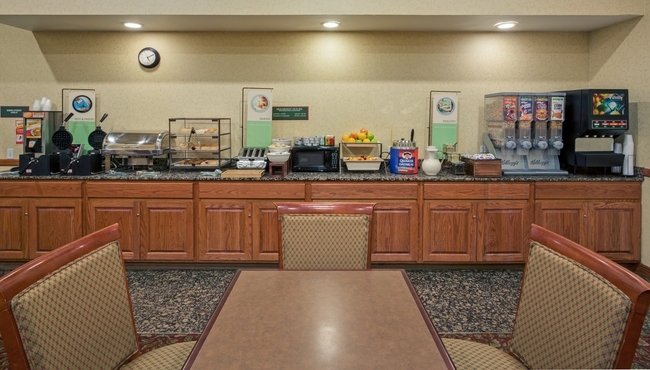 Let the morning traffic clear out while you enjoy a bowl of cereal or a cup of yogurt at the complimentary, hot breakfast, served daily at the Country Inn & Suites, Merrillville, IN. We set out an array of sweet and savory treats like bacon, eggs, Belgian waffles, fresh fruit and more, and we keep the coffee coming all day long. For lunch or dinner, explore the dining options near the hotel such as Red Lobster, House of Kobe or Sheffield’s Restaurant & Sports Bar. Mon-Fri, 6:30 a.m. - 9:30 a.m.